MANILA, Philippines (AP) — Philippine officials say they will soon begin negotiations with the United States on a larger American military presence to help deter what they say is increasing Chinese aggression in Philippine-claimed waters in the South China Sea. In a letter to Philippine congressional leaders, the secretaries of national defense and foreign affairs said that allowing American troops to have an "increased rotational presence" will help the country attain a "minimum credible defense" to guard its territory while it struggles to modernize its own military, one of Asia's weakest. A larger American presence would also mean more resources and training for responding to disasters in a nation often battered by typhoons and earthquakes, Defense Secretary Voltaire Gazmin and Foreign Secretary Albert del Rosario said in their letter, a copy of which was obtained by The Associated Press on Thursday. "The Philippines will shortly enter into consultations and negotiations with the United States on a possible framework agreement that would implement our agreed policy of increased rotational presence," Gazmin and del Rosario said. U.S. officials were not immediately available for comment. The presence of foreign troops is a sensitive issue in the Philippines, a former American colony. The Philippine Senate voted in 1991 to close down major American bases at Subic and Clark, near Manila. The Philippine Constitution forbids foreign troops from being permanently based in the country, but the Senate ratified a 1999 pact with the United States that allows temporary visits by American forces. Gazmin and del Rosario assured lawmakers that any new accord with Washington "will be consistent with our constitution." Several of China's neighbors have been alarmed by Beijing's recent assertiveness in claiming large areas of the South China Sea. Manila's desire to bolster its external defense and security has dovetailed with Washington's intention to pivot away from years of heavy military engagement in the Middle East to Asia, where it has been fostering closer economic and military alliances with countries such as the Philippines, partly as a counterweight to China's rising clout. The realignment of American forces in the Asia-Pacific also involves the deployment of up to 2,500 U.S. Marines in northern Australia and the stationing of U.S. combat vessels in Singapore. Gazmin has said that additional American troops would only be allowed to have access to the country's existing military bases under terms the Philippines would negotiate with the U.S. government. The two sides would have to negotiate the length of any agreement allowing more U.S. troops, planes, ships and other equipment. Under the current Visiting Forces Agreement, hundreds of American counterterrorism troops have been allowed to stay in the Philippines' volatile southern Mindanao region since 2002 to train Filipino soldiers battling al-Qaida-linked Abu Sayyaf militants and a handful of foreign terrorist suspects from Indonesia and Malaysia. Gazmin and del Rosario stressed in their letter the importance of the Philippines' decades-old military alliance with the United States, saying "this relationship is useful not only in our diplomacy but also in enhancing our capabilities at the vital task of territorial defense." The Philippines has reached out to the United States for help in modernizing its outdated fleet of warships and planes and in training its troops amid renewed tensions over the long-running territorial disputes with China. 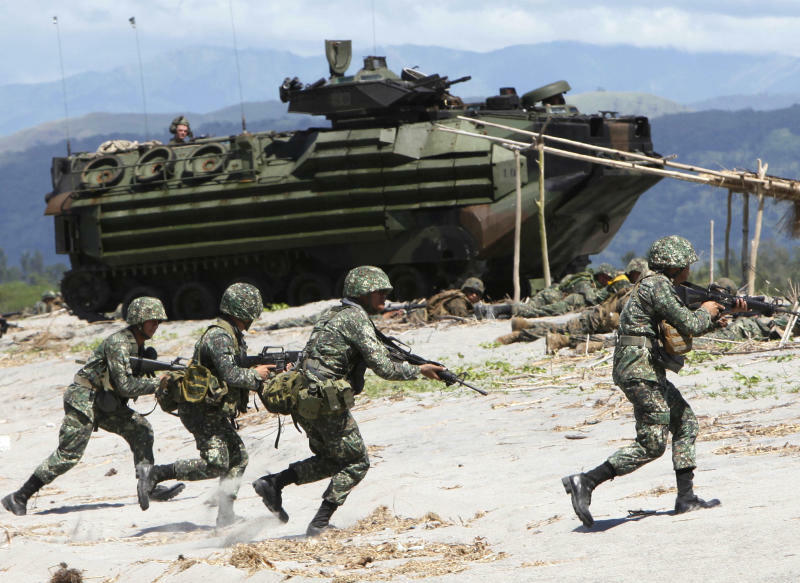 President Benigno Aquino III said last month that foreign troops, if given access to local military camps, would not become a "permanent fixture." He stressed that while such an arrangement would allow the country to better prepare for any security contingency, the Philippines as a matter of policy renounces war and chooses diplomacy to resolve territorial claims. Confrontations involving Chinese patrol ships and vessels from the Philippines and Vietnam over disputed islands and reefs have raised tensions in the potentially oil- and gas-rich waters. China claims much of the South China Sea on historical grounds. The Philippines, Vietnam, Brunei, Malaysia and Taiwan have rejected Beijing's massive claims, sparking fears the disputes might turn violent and set off an armed conflict. Confidential Philippine military surveillance reports seen by the AP said that 61 Chinese vessels were sighted in Manila-claimed areas of the disputed Spratly Islands from July 4 to 10. China has also turned Mischief Reef, which it occupied in 1995 amid protests from Manila, into a logistical base to help Chinese ships better patrol the seas. China has also erected two concrete posts at the narrow entrance of a vast lagoon to erect a rope barrier and better control entry into Scarborough Shoal, a rich fishing ground which came under Beijing's control after Philippine ships backed off from a tense face-off last year.